Abádszalók is a rural village along lake Tisza, at 24km from Lake Tisza Holiday Homes (half an hour by car, but you can also cycle along the bike path on the embankment of the lake). By car, this beach is also easily accessible. Parking is available. The large bay at Abádszalók attracts many guests in the summer months and it is very very busy, but certainly worth a trip from your Lake Tisza Holiday Home. 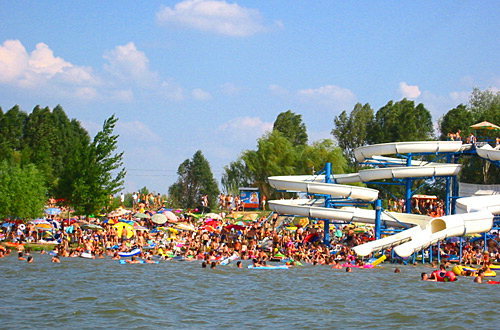 Swimming (water temperature in lake Tisza is everywhere around 24º C average), super slide, bouncer, pedal boat or canoe belong to the possibilities here. There are plenty of restaurants and bars to indulge. 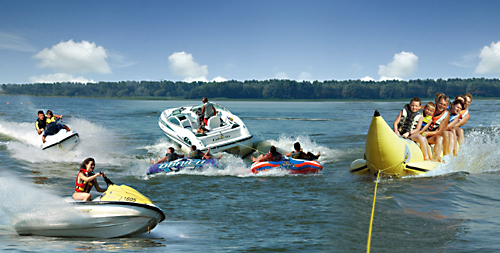 For the sports enthusiast, there is plenty to do. 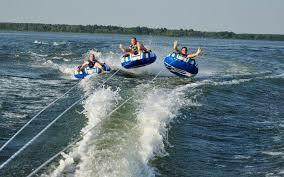 How about water skiing, jet skiing, para-sailing, or even sit on a 6-seater banana tugged behind a motorboat? There is a possibility to rent bikes. Next to (wild)water fun, there is also a doll museum with dolls in national costume in Abádszalók . 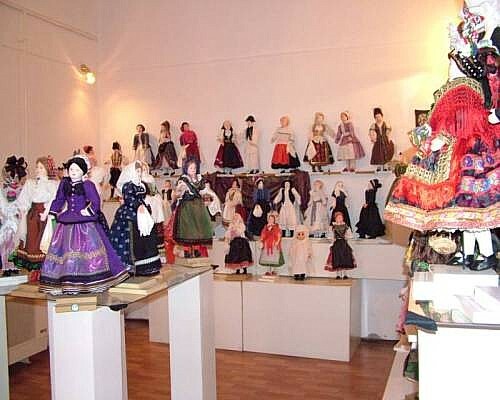 Abádszalók hosts the first doll museum in the country where a collection of folk costume from the entire Carpathian Basin is on display: more than 350 dolls (István utca 41 király). During the summer months there are shows to keep you entertained. Some examples: beach football tournaments, volleyball, horse show, folklore-day, water play, Miss election, election strongest man etc. An information booklet what can be collected at the tourist office.